After being a coach at CrossFit South Brooklyn in NYC for 6 years I moved halfway across the country to open my own affiliate, CrossFit Lumos, in Austin, TX. This series will chronicle my experience opening the gym and what I am learning along the way. This article is the final piece of the adventure, before I’m a real live gym owner. Part 1. Part 2. Part 3. Part 4. Part 5. Part 6. Part 7. Part 8. Part 9. The CrossFit Games Open has always been my favorite time of the year. Despite personally having been described by my fellow coaches as a “slightly above average” CrossFit athlete (kisses), I still love the Open. I love the suspense, the strategizing and obsessing over each workout, what great challenges they are, and the way they bring together the CrossFit community, large and small. 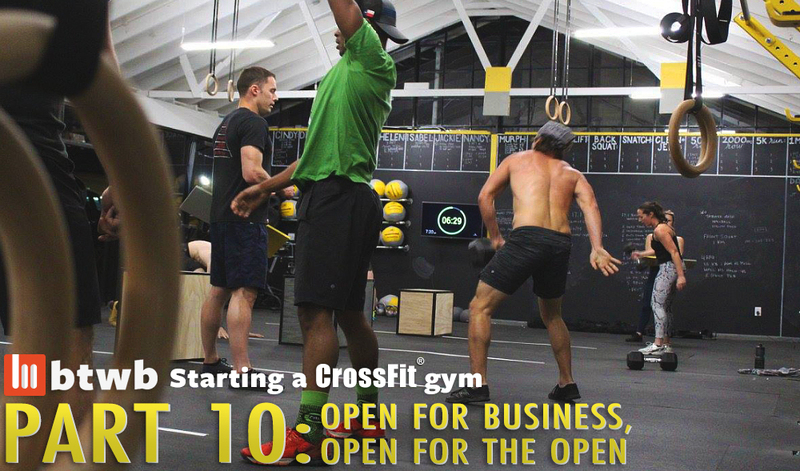 My gym, CrossFit Lumos, opened it’s doors about 6 weeks before the Open, so we had a unique challenge in getting new members up to speed, building buy-in, and using the Open to make our community stronger. Since a lot of my members were very new to CrossFit, after first explaining what the Open was and how it worked, I had to figure out what would make someone sign up and pay money to compete in something they’d only recently started. My big sell, and a comparison I’ve used before is running a marathon. Marathons are inherently boring (sorry runners), but one big selling point is that you race on the same course, at the same time, as the world’s best. No basketball fan ever goes to the local park to shoot around and happens to get into a pickup game with Steph Curry, so this is pretty cool. The Open is the same way- by participating, you are in some way connected to the titans of the Sport of Fitness. We’d show the announcement each week on our TV, which let new members get acquainted with the big names in the sport, see how damn good they are, and better understand how competitive CrossFit works. Second, the Open is an amazing community event. Knowing that hundreds of thousands of CrossFitters around the world are throwing down with/against you is a cool feeling. CrossFit is not just a fitness regimen, but a lifestyle driven community that celebrates hard work, camaraderie, and fun. The Open ties you into that larger philosophical piece. Last, every year I’ve participated in and coached athletes through the Open I’ve seen people forced to work outside of their comfort zone. Whether it’s working with a weight they considered out of their reach, attempting a new skill, or pushing deeper into discomfort and the “pain cave,” the Open sets a standard and demands that people rise to it. Each year I’ve seen instances of people realizing that their potential and ability far exceeded their estimation, and I sold that point to my members. I programmed the Open workouts to be our Group Class workout on Saturdays, and we also held a “Friday Night Lights” community event on Friday evenings. Our Friday night group was fairly small but was bolstered by a few drop ins. I also let people who weren’t signed up to compete on Fridays if they wanted the more energetic setting, and I didn’t count the Friday session as a class taken, so people had a bit of a financial incentive to come. We had a great time, and often would go out for dinner or a beer afterwards which I thought was great because a) I like beer and b) it helped my nascent community get much closer much sooner than they may have normally. I’m already looking forward to next year, and planning on how to make it a great month for my community to build around. I’d like to make the announcement more of an event, build out the Friday night competition, and get at least half my members signed up. Also, my awesome coach @annalee_woods took top 50 in our region, so this next year we will be working hard to get her to Regionals, which will also be cool for the gym to rally around. The 2018 CrossFit Games Open can’t come soon enough!